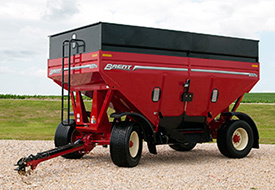 New Brent® Q-Series Grain Train® Wagons Are Quick, Quiet, Convenient - Unverferth Mfg. Unverferth Manufacturing Co., Inc., announces the availability of the Brent® Q-Series Grain Train® wagons. Brent wagons have been synonymous with innovations in grain-transport convenience and the new 757Q, 657Q and 557Q models with capacities of 750, 650 and 550 bushels respectively, continue that tradition – quickly, quietly and conveniently. Equipment efficiency is paramount during harvest and the exclusive push-button operated unloading door allows the operator to quickly and effortlessly unload from either the front or rear. The larger door opening unloads the grain as quickly as 60 seconds depending on model. The integrated chassis design incorporates a load-equalizing torsion bar rear-axle, coupled with a front rocking arm bolster for keeping the wagon level and stable during loading and transport, and quiet when empty, even over the bumpiest gravel roads. Available options include molded plastic fenders with LED side marker lights to protect the finish; dual wheels for the 757Q and a variety of wheel and new- or used-tire sizes. A rollover, 18-ounce canvas Weatherguard tarp for protecting load contents features a self-locking device for keeping the tarp securely in place during transport. Optional electric tarp operation is also available. Visit brentequip.com for full details, or your nearest Brent products dealer.